Daisy is turning 40. To make the crises worse, her five sisters pray over her unmarried status and THEN her cat begins speaking English with a British accent! Well no wonder the cat quotes William Shakespeare sometimes! Daisy did name the cat Shakespeare after all. Glen Livet, a Scottish reverend formerly known as the Drunken Beast. Harvey Von Wallbanger, an Austrian aristocrat obsessed with beauty. Olive Martini, a Southern politician with a fetish for enhanced body parts. Johnny Walker, a realtor who likes to stage a woman. Joey Cuervo, a native New Yorker who bonds through blackmail. Yeung Ling, a recently-divorced hairdresser and karate expert with killer hands. And then there is Daisy’s neighbor, a nurse with a voice sounding as if he would like to cut off her life support. This is a good effort at humor and Kooky quirky fun. The Narrator does a good job in maintaining the zany crazy nature of this unique Audio Book. I've had a hard time finding "funny" books that I think are funny. That being said, this is a funny book. The back and forth between Daisy and Shakespeare is great. I listened to the audiobook and voice acting was good. I enjoyed Shakespeare quite a bit. The story was fun to listen to and I had a hard time turning away. Laugh out loud moments! This was such a fun book to listen to. The narrator was the absolute best. I was a little concerned about liking Shakespeare but then I couldn't live without him. What a hoot!!! The opening morning after the night before seems to have wandered into a Shakespearean fairy tale or, more likely, nightmare. Dysfunctional is inadequate to describe Daisy's family; each of the sisters is a bigger mess than the last, but her siblings, mother and aunt are all focused on relieving her, at nearly 40, of the stigma of spinsterhood. Enter the cat . . .
Stacy Gonzalez narrates with gusto and has a great deal of fun with various American, British, and Scots accents as our heroine bumbles her way through blind dates from hell. Prepare to suspend your disbelief and laugh out loud as the absurdities pile up. It delivers a real giggle! I was looking for something light and easy to listen to, something with some good characters and a few laughs and this book delivered. The narrarator did a great job, it was obvious that she enjoyed the material and really got into it. The characters were fun, I really liked the cat, and the story was relatable. Nice and easy read/listen. I found this to be a refreshing quirky listen. I loved Shakespeare the cat in this story, along with the meddling sisters and unique other characters. Daisy had something about her that I really enjoyed too. This book by Belinda Austin is original and fun. The narration by Stacy Gonzalez was fitting. I requested this review copy audiobook and have voluntarily written this review. Daisy wants a relationship with a man, so far she has a relationship with her cat Shakespeare who smokes drinks and talks. The dialogue and pictures painted by this story are fantastic. You need to suspend belief and just have fun with this story. The narrator is so fantastic that story is a play you can’t wait to hear what happens next. Worth a credit or money. Have some fun! I received a free audiobook for an honest and voluntary review. 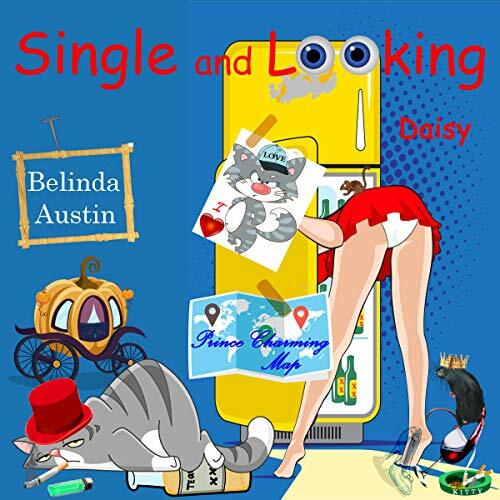 This is a quirky, book with lots of sexual innuendos, as Daisy tries to find Mr Right. However, each of these "men" (I will use the word loosely) each have alcoholic names (which should be her first clue) and she has a British speaking cat, Shakespeare, which just adds to the craziness of this story. Narrator did a wonderful job, with both her American English as well as her British accent (for Shakespeare). Wonderful story, really great narration, really enjoyed it! Please take a moment to click the "YES" ("Helpful") button below if you found this review helpful :) Thank you!